Pensacola Palm - Private Pool and Hot Tub !!! Have you been searching for a Pensacola Beachhouse with a private pool and hot tub on Pensacola Beach? Well, we have it! Click the link to our personal website listed below for lots more pictures, guest comments, etc. We've worked hard to make sure our guests of all ages enjoy their vacation. The 12' x 24' pool has a shallow area that is about 6” deep for mothers and babies, or sunbathers who want to stay cool in the water! 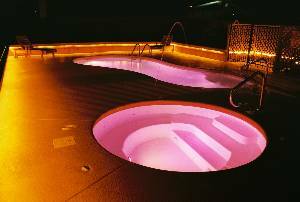 It also has shallow steps, then gradually slopes from 3' to 5’'8"”, with special 4-color rotating lighting in the pool at night. Two water jets, one on each side of the pool deck, shoot water into the shallow end of the pool. There is plenty of room around the pool for tables and chairs, and there is also an 87' bench that surrounds most of the pool! It's great for sunbathing and at night it has indirect lighting underneath that gently lights the entire pool area. In addition, we also have an 8' 6" diameter HOT TUB with a blue light that our grandson calls "The Smurf Pool"! This is the best of both worlds. The pool and hot tub area are surrounded by a 6’ privacy fence and a 5’ metal fence, with the required security gates and latches. The pool has a salt system that eliminates the harsh chemicals that most chlorine pools use. Even though we refer to it as a “salt system”, the water is not salty. The advantage is that it will not turn your hair “green” and it will not dry your skin out like regular chlorine pools do. It won’t burn your eyes, yet it provides the same sanitation that a chlorine system pool does. A salt system pool is a giant step in advancement of pools! During the day Grandpa and Grandma can relax beside the pool, and if they’re not working on their tans, they can relax in the outdoor, covered "Family Room Down Under" which is under the house (the house is on pilings) where there are plenty of tables and chairs, and even a hammock! From there they can watch everyone in the pool and at the same time enjoy the constant cool ocean breeze. At night, the "Family Room Down Under" is lighted, so the entire family can enjoy outdoor entertaining to its fullest, both in the pool, the hot tub, and the weather-protected "Family Pool Down Under! You will be able to have outdoor “picnics” around the clock! With the Gulf just one short block away, you will have the best of both worlds to choose from! 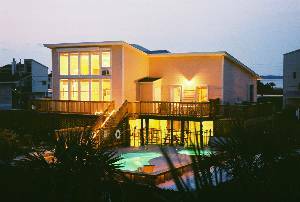 There are very few rental beachhomes on Pensacola Beach with private pools and hot tubs, so book early. We are filling up fast! If you or any of your guests smoke-don't call us. We have worked hard to make sure our homes are clean, well equipped, and smell good! If there is any evidence of smoking &/or pets anywhere on the premises, you will be evicted immediately with no refund of any monies paid, including rent and security deposit. Relax on Santa Rosa Island (Pensacola Beach), famous for its pure white sand beach and crystal clear, turquoise water! Make those family vacation memories now, before it's tool late, and everyone has grown up and gone their separate ways. Bring them all together for a fun-filled, memorable vacation today! Our "Pensacola Palm" home, named because of the mosaic Palm tree cleverly laid in the Mexican tile of the entryway, is not your normal beach rental home. We take great care in making sure that you have a clean, well equipped, comfortable home for our guests. One block from the Gulf (less than a 2 min. walk) and two blocks from the Bay/Sound, this 4 bedroom, 3 bath (2 of them are Masters), large open living/dining/kitchen area home, is waiting for your family to fill it with memories! For even more memories, don't forget to ask about our special discounted golf packages! We provide high speed, wireless internet. Baby crib/play pen; Combination recliner, highchair, booster seat; baby gate, high chair. Open living room/dining/kitchen area. 4 bedrooms, 3 baths. Both master bedrooms have king size beds. Loft bedroom has queen sized bed with all glass wall looking out to the Gulf. "Kids" room has full bed with pull out twin trundle underneath. Two sleeper sofas in living room. New hardwood floors in all the bedrooms. Saltillo tile in kitchen, dining and living area. 2 Master baths plus one more additional bath. Whirlpool tub in one master, shower in the other. Hall bath has tub/shower. Decks on front and back of home. Views of both the Bay and the Gulf from the decks. "Family Room Down Under" is open air yet private. Has picnic table, hammock, high table and 4 chairs, many single chairs, toys for sand, pool and gulf. Designed for fun. 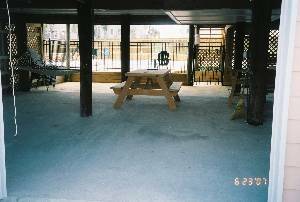 Deck and patio furniture, beach towels, games. 32" TV with surround sound and DVD player. 4 other TV's, most with VCR players. We provide our own personal towels and sheets. We do not use a linen service. All your bottom sheets are fitted and the towels are soft! Starters of dish soap, diwhwashing detergent, hand soap and toilet paper are provided. Please let us know if you need special accomodations for babies or smaller children. We will be glad to arrange what you need. 2 outdoor hot/cold showers. Two beach wagons designed for easy pulling on the sand for getting all your stuff over to the beach! Poolside has 4+ chaise lounges, and picnic table. Pool has shallow ledge that is approx. 6-9" deep for babies and shallow water sunbathing. Hot tub is 8.5' in diameter. Seats approx. 8-10 guests. 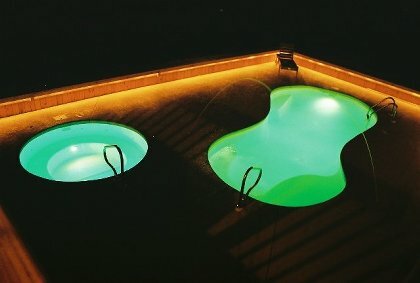 Colored rotating lighting in both pool and hot tub. Pool gates are installed according to code for child proof safety. 87' seating bench on 3 sides of pool with indirect lighting underneath the seating. Cable lighting along stairs and deck railings for safety comes on at dusk and off at dawn. Licensed Massage Therapists who will come to our home and bring their own portable bed. Professional Photographer to take those priceless family photos, on the beach! Babysitters so you can “escape” for a few “grown up” hours. Snorkeling, miniature golf, pier fishing, surf fishing, and deep sea fishing. Two blocks away are lighted tennis courts, roller hockey court with basketball goals, running track, covered picnic table and children's play area. Emerald Coast Classic in March. Special fireworks for the 4th of July. Blue Angels summer air show usually the weekend after the 4th of July. Pensacola Beach Triathlon in October. Fort Pickens, Pensacola Naval Aviation Museum with IMax theater, zoo, historic downtown Pensacola. Pool, hot tub, and covered "Family Room Down Under" provides 24 hr. fun! Guests of all ages have fun with the rotating colors of pink, blue, green, white. Our "Family Room Down Under" is a great gathering place for weather-protected outdoor dining, games, and pool watching. My family stayed at this home last October 2003, and we loved it. It was the perfect vacation home. We are wondering how it fared against hurricane Ivan. Please respond if you have any pictures or information. We would definitely like to rent the home again on our next trip to Pensacola. Please call for Last Minute Specials and Monthly rates. Rates do not include 11.5% tax, $150 cleaning fee and $1000 Security Deposit. Rental rates subject to change without notice. Deposit: Advance Deposit - equal to one half of rent at time reservation is made. Other half of rent, 11.5% tax and $1000 Security Deposit, due no later than 4 weeks prior to check in. Cancellations and Refunds: NO SMOKING-NO PETS-NO TOLERANCE. IF YOU OR YOUR GUESTS SMOKE-DON'T CALL US. If evidence is found of smoking &/or pets, you will be evicted with no refund of any monies paid, including rent and security deposit. Call for special arrangements for shorter or longer stays during the winter months. Cancellation must be in writing. Every attempt shall be made to re-rent the home. If the home cannot be re-rented, your Advance Deposit will be forfeited. In the event cancellation is made 30 days or less prior to check in, entire amount of rent will be forfeited unless home can be re-rented. Other Fees: $1000 Security Deposit, refundable within 3-4 working days if there is no damage. Required Stay: Sat-Sat; flexible in winter.